Unless you are from the state of Ohio (and even that isn't a guarantee), then you probably haven't heard of the Hocking Hills. Located in southeastern Ohio near the town of Logan, “the Hocking Hills” generally refers to Hocking Hills State Park and Hocking Hills State Forest and all the caves, waterfalls, and hiking trails that are contained within them. Yes, Hocking Hills is an outdoor-lover's paradise. Even though I've lived in Ohio my entire life (and HAD heard of the place), I didn't visit Hocking Hills until I was nearly 30. Shame on me, I know. Once I finally got there, I realized what all the hype was about – and knew that I definitely needed to share this corner of Ohio. We spent the weekend doing all the “must-dos” in Hocking Hills, which included hiking, zip lining, relaxing in a hot tub, and more. Hiking is definitely the main draw of Hocking Hills thanks to the unique rock formations, caves, and forests that can be found throughout the park. The park has six main hiking areas, with most of them centered around natural sandstone rock formations. Elliot and I weren't up for any long hikes, but thankfully the most popular sites are easy to reach without hours of trekking. This is probably my favorite area of the Hocking Hills because of the scenery: forests, a gorge, caves, and even waterfalls. What more could you want? There are a few different trail options in this area depending on where you start. We stopped at the visitor's center first and then headed for the Upper Falls for some photos. From there, we headed back the way we'd come and continued down to the gorge and Old Man's Cave itself. This huge recess cave got its name from a hermit named Richard Rowe who lived in the cave here back in the early 1800s. Past the Lower Gorge beyond Old Man's Cave, you'll find the Queer Creek Valley. And here, tumbling down a sandstone chute, is Cedar Falls. The falls are at their peak in the spring, and it's not uncommon to find people swimming or soaking their feet here when it's warm. The most popular hike in Hocking Hills is to Ash Cave, a giant recess cave with a small waterfall tumbling over it. The hike to Ash Cave is only about half a mile long and is along a paved trail, making it accessible for nearly everyone. To get to the cave from the main parking lot, you walk through a narrow gorge filled with hemlock and beech trees that suddenly opens up into the cave – it's quite impressive! Ash Cave itself is shaped a bit like a horseshoe and measures 700 feet wide and about 90 feet high. Can you spot the teeny tiny person in this photo? Gives you an idea of how huge this cave really is! Other popular hiking areas in the park include Rock House, Cantwell Cliffs, and Rock Bridge, which is the largest natural bridge in Ohio. If you want to make a day of hiking, there's a 6-mile trail that starts at Upper Falls in the Old Man's Cave area and then continues on to Cedar Falls and then Ash Cave. The trail is called the Grandma Gatewood Trail, and it's actually part of the much longer Buckeye Trail. Because of the Hocking Hills' natural topography, it's actually kind of perfect for zip lining – which is probably why there are now multiple companies offering the activity in the area! 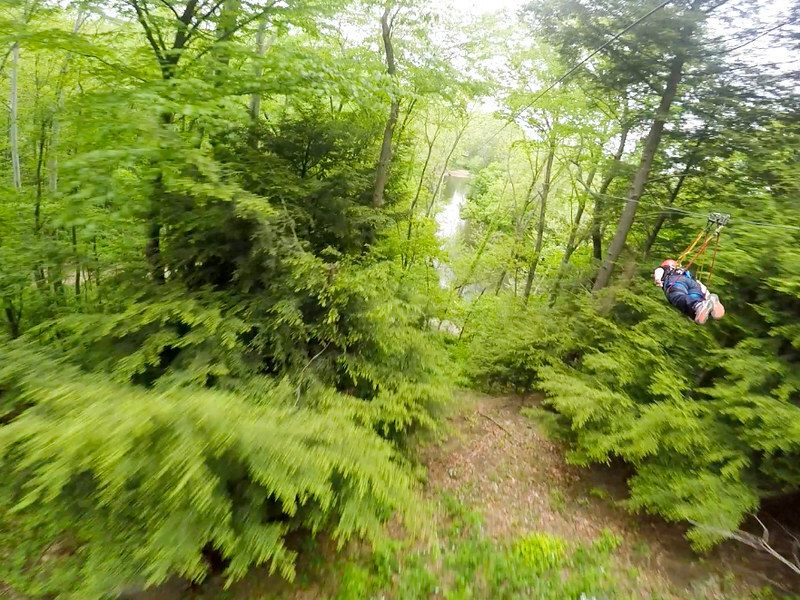 Elliot and I went zip lining with and did their SuperZip tour, which has you flying Superman-style through the forest at about 50 mph. We also checked out some of their other zip lines, including one (on the “X” Tour) that has you zipping INTO a cave!! Hocking Hills Canopy Tours also offers an , which is an insanely fun way to explore the park and surrounding forest. These off-road Segways are FUN! After all that outdoor adventure, you may need to add in a more relaxing activity in order to balance things out. I recommend checking out the , which just opened in 2015. They've already started serving their own locally-grown and crafted wines, along with others that they make with grape juice from around the world. 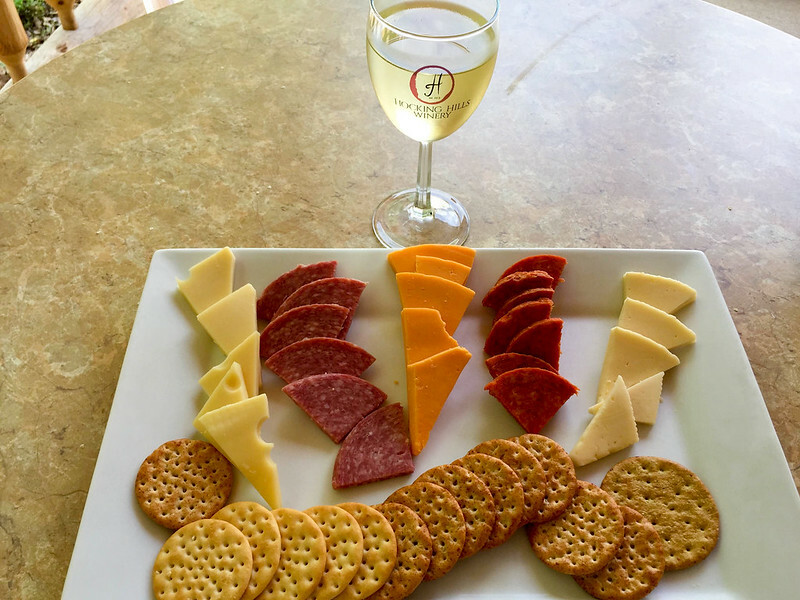 The coolest thing about this winery is that since they don't serve food beyond appetizers, they welcome patrons to order meals from local restaurants, or to bring their own food and use the grills on the outdoor patio. How cool is that?? There are a variety of campsites in Hocking Hills State Park, and many visitors choose to pitch a tent or bring a camper van for the weekend. But for the true Hocking Hills experience, you'll need to rent a cabin in the woods. Cabin rentals can be found throughout the county, many within a few miles' drive from the best hiking trails. Most will come fully equipped with a kitchen and barbecue or fire pit, and the good ones will have a hot tub out on the back porch so you can properly unwind and enjoy the nature. Elliot and I stayed in a cabin at , which has beautiful wooden cabins near the Old Man's Cave trailhead. Our cabin had a full kitchen and a hot tub on the back porch and made for the perfect romantic getaway with a heavy dose of nature. – The top-rated cabins in Hocking Hills. – A great luxury option in the park. – A Scottish-style manor house along with cottages that makes for a great couples retreat. – For when you want to sleep in a castle! And this of course is not an exhaustive list of everything you can do in the Hocking Hills! You can also rent canoes on Lake Logan and Lake Hope, go horseback riding through the park, or even go antique shopping in nearby Logan. Check out for even more info on visiting the Hocking Hills. Have you ever been to the Hocking Hills? If not, is it somewhere you'd like to go now? *Note: This post contains a few affiliate links, meaning if you make a purchase/booking after clicking on a link, I may make a small commission (at no extra cost to you, of course!). Ohio is full of surprises! 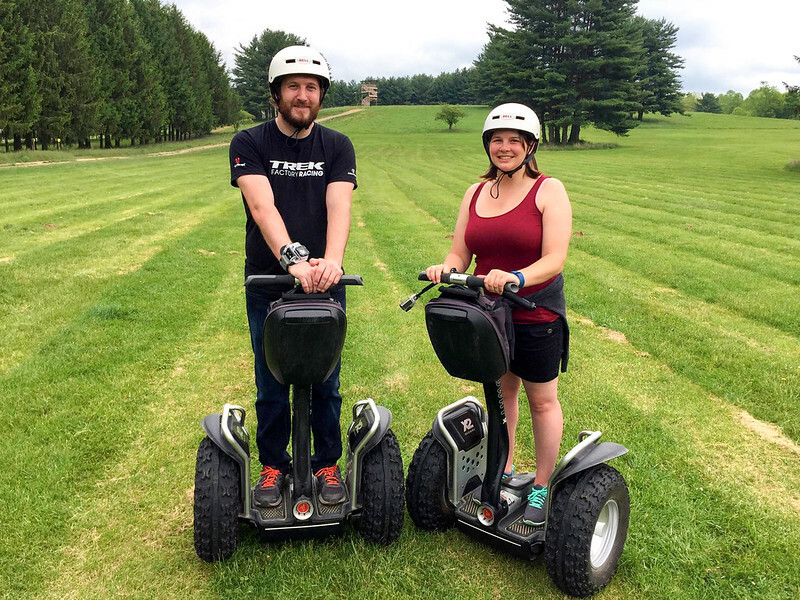 😉 And I had no idea that off-road Segways were a thing, either, until we tried them! Super fun (though kind of terrifying when you’re going downhill!). Awesome post! In case you missed it, there’s an app that can help you get around the area as well with hiking trails and driving directions and such. I even believe it has discounts to local businesses – I just searched “Hocking Hills” on the app store to find it! Great tip! I’ll have to check that out next time I’m down there. I live in Cincinnati and this place is great for a day trip so beautiful especially at different times of year. I would love to go again in the fall – I imagine the colors must be insane! Hocking Hills is a great place — so beautiful! Thanks for the extra info – what an inspiring lady! What a beautiful place! These pictures are fantastic, the one of the mossy stone bridge looks like something right out of one of Tolkien’s novels! America’s natural beauty never ceases to amaze me, the diversity of each state is marvellous, to say the least! It seems like the Hocking Hills are a great place for a fun adventure. Even just Ohio is incredibly diverse! Lots of beautiful spots right in my home state. wow ! really interesting places to see in Ohio, what a dramatic landscape thanks for sharing hidden secrets and pictures. Happy to introduce others to my state! Hocking Hills and Mohican weren’t on my radar at all until I moved to Columbus (from another Ohio city but I was only 21 then). I looove Old Man’s Cave! I’ve stayed at the Chalets – but it’s been awhile. Sadly, I’ve never stayed at Ravenwood Castle. I’ve visited it and it’s awesome. It’s really cool to read about cool stuff in my own state. I haven’t been there in awhile and I didn’t know about the Grandma Gatewood trail. I remember the first time I went to Old Man’s Cave, it was really icy. We still scrambled along the trail to see the frozen water falls. It was totally worth it. Sometimes, I forget that Ohio is a pretty awesome place! Ohio IS a pretty awesome place! And Hocking Hills in the winter sounds awesome – the photos of frozen waterfalls always look so cool! I keep thinking how lucky you guys are in the US when it comes to nature and wildlife. All the more reason for me to return to the US one day. I would love to visit all those beautiful spots and NPs. We are indeed quite lucky with all the awesome nature we have right on our doorsteps! That’s a pretty cool place! I could totally pretend I’m in the Lord of the Rings, there!! :p The zip-lining seems like a fun things, too! I’m hoping to take my husband here for his birthday this year. It’s only a 4.5 hour drive from where I live. Do you know anything about tent camping in Hocking Hills State Park? Akatuki! I’ve heard of it!!! I have a friend living in Ohio trying to convince me to come out there and hike and camp and Hocking Hills was one. Looks stunning, I want to go soon! You would love it! This part of Ohio is made for the outdoor-lover! The Hocking Hills would make a great stop on a cross-country RV trip! I have heard of Hocking Hills, but had no idea how beautiful it is! I may have to add this to my “Best of the Midwest” tour this summer before I move away! I think it should definitely qualify as a “Best in the Midwest” spot! It’s a gorgeous part of Ohio, and there’s so many cool things to see. I’ve never heard of Hocking Hills, but it looks awfully nice! It’s pretty awesome – I’m really proud that it’s in my home state! I know, it’s crazy! I do make it a point to take at least one or two big trips in the US each year for this very reason, though – I want to make sure I see just as much of my own country as other ones! I’m most intrigued by Ash Cave, your photos are terrific. I never stand to be amazed by such incredible natural wonders! You definitely should go! It makes for a great weekend trip. Amazing photos! My husband’s family is from Ohio and we didn’t know anything about this! We’ll have to visit next time we’re out there! Absolutely! It’s definitely worth a visit if you’re in the area. I went to the Hocking Hills for a wedding a few years ago and absolutely fell in love with it. What a stunning, often overlooked part of the country that is, for sure! That’s awesome that you’ve been there! It really is a really special corner of Ohio. Hi, Thanks for this. I’m a Hong Konger living in the UK, but we’re planning a trip to the US next year! We’ve been looking for some real off the beaten track destinations, Hocking Hills seems to tick all the boxes! Just trying to work out how we can fit it into our schedule (that’s the tricky bit)! Ohio in general is such an underrated state! New York and California (and Florida) are usually the go-tos for international visitors, but I could argue for days about how awesome Ohio is, too!